Sir Georg Solti (pronounce: “George Shollti”), (born Budapest, 21 October 1912; died Antibes, France, 5 September 1997) was a Hungarian conductor who later became a naturalized British citizen. Solti was born György Stern in Budapest to a Jewish family. His father changed his name from György to Georg and changed his family name to Solti. This was so that his name did not look Jewish, because there was a lot of antisemitism in Europe. He learned the piano but, when he was 14, he heard Erich Kleiber conduct Beethoven's Symphony No. 5 and he immediately wanted to be a conductor. He studied at the Franz Liszt Academy of Music, under Béla Bartók, Zoltán Kodály, Leo Weiner and Ernst von Dohnanyi. By 1935 he was becoming known as a conductor. He conducted The Marriage of Figaro at the Budapest Opera in 1938. It was the first time he had conducted there, and it was also to be the last time. That very day, Hitler annexed Austria. Life became dangerous for Jews in Hungary. In 1939, he moved to Switzerland, where he continued a career as a pianist and won the Geneva International Piano Competition, but he did not have many chances to conduct there. His father became ill and died, so he never saw him again. After World War II Solti became music director of the Bavarian State Orchestra in Munich (where he gave the first performance in Germany of Paul Hindemith's opera Mathis der Maler, which had been banned when the Nazis were in power. He conducted the Frankfurt Opera where he gave the first performance in Germany of Alban Berg's Lulu. In 1951 he performed at the Salzburg Festival conducting Mozart's Idomeneo. Solti often conducted the Los Angeles Philharmonic, and it was arranged that he would be their main conductor (music director) from 1962. However, Solti changed his mind because they appointed Zubin Mehta as assistant conductor without telling Solti. Mehta became musical director instead. In 1961 Solti became music director at the Royal Opera House, Covent Garden, and stayed there until 1971. He was a great conductor, but made the musicians work very hard. With his bald head he got the nickname "The Screaming Skull". He spent much of his time in Britain and the United States. His first marriage ended in divorce. His second marriage was to Valerie Pitts, a British television presenter whom he met when she was sent to interview him. They had two daughters, Gabrielle and Claudia. He was given an honorary Order of the British Empire (KBE) in 1971. The next year he became a British citizen, and was then known as Sir Georg Solti. Solti helped many young musicians, training them in workshops and giving them opportunities to perform. 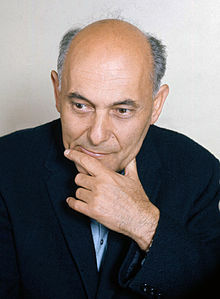 Solti was music director of the Chicago Symphony Orchestra (CSO) from 1969 until 1991, when he was given the title of Music Director Laureate, the only CSO conductor to be given that title. He made them into a world class orchestra and took them on tours to other countries. He gave 999 performances with the CSO. He died before his 1,000th performance. A square near the Symphony Center in Chicago was called "Sir Georg Solti Place" in his memory. Solti also had other jobs. He was music director of the Orchestre de Paris from 1972 until 1975. From 1979 until 1983 he was principal conductor of the London Philharmonic Orchestra. During this time with the London Philharmonic he performed and recorded many works by Elgar including the two symphonies, the Violin Concerto with Kyung Wha Chung and the Cello Concerto with Julian Lloyd Webber. In 1983 he conducted Wagner's Ring Cycle at Bayreuth for the only time. For the 50th anniversary of the United Nations, Solti formed the World Orchestra for Peace, which consisted of musicians from 47 orchestras around the world. Solti worked with Dudley Moore on a 1991 television series, Orchestra!, which was made to explain to people all about the orchestra. Solti never retired. He had many plans for concerts and recordings when he suddenly died of a heart attack on 5 September 1997 in Antibes, France He was given a state funeral, and was buried next to Bartók who had been his teacher and had helped him a lot. Solti’s widow and daughters began the Solti Foundation to help young musicians. This page was last changed on 15 November 2018, at 05:51.